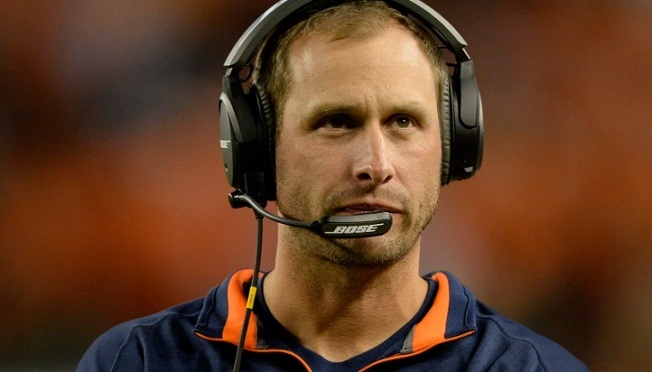 Chicago Bears offensive coordinator Adam Gase was a hot coaching commodity last season, but after a year that saw him help Jay Cutler to a career season and guide the Bears through an injury-ravaged campaign, his stock is potentially even higher. His performance with the Bears in 2015 has plenty of teams interested in his services, and according to several reports, he already has three interviews lined up this week for head coaching vacancies. According to Ian Rapoport of NFL Network, Gase will interview with the Philadelphia Eagles on Tuesday, the Cleveland Browns on Wednesday, and the Miami Dolphins on Thursday. After nearly becoming the San Francisco 49’ers head coach last offseason (before the team demanded that he keep Jim Tomsula as defensive coordinator, which he refused to do), Gase ended up rejoining John Fox when the coach became the boss in Chicago. Gase led the Denver Broncos’ offense to a stellar 2014 campaign, and although he didn’t quite match that performance in Chicago with Cutler and company, he still did a remarkable job considering the challenges that he faced. If Gase ends up leaving Chicago, and it’s becoming increasingly likely that he will, the Bears will have plenty of options to replace him. QB Coach Dowell Loggains could be an interesting candidate, based on his relationship with Cutler, but the team could go outside the organization as well. One potential candidate is Detroit Lions offensive coordinator Jim Bob Cooter, who has made a big-time name for himself with his performance with the team this season, and another is former Tennessee Titans head coach Ken Whisenhunt, who has been lauded for his ability to work with NFL quarterbacks.